Continual improvement in processes and techniques to make them efficient in accordance to international best. Creating value to employees, partners and clients. Meeting statutory and regulatory requirements. Involving employees in continual quality improvements. Establishing measurable quality objectives and performance indicators at various levels. Santec is at all times aware of it's managerial, moral and legal duty to protect it's employees from situations likely to create accidents. The company assures its full commitment to watchful management and supervision in order to create sites and workplaces where possibility of accidents is kept at minimum. 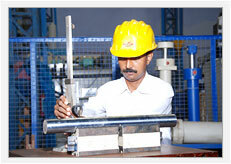 Periodic inspection will be conducted to ensure the adherence of safety procedure in the workplace. Feedbacks will be incorporated for continuous improvement. All hand tools provided by our company for use shall be safe in so far as same is reasonably practicable. Training to be given educate & increase awareness of safety at workplace. Notices, posters, reminders etc., shall be placed in positions to constantly keep the safety doctrine in the minds of personnel. Provide clothing and equipment which will adequately protect personnel and which is appropriate to the work in hand. First Aid kid and Emergency contacts shall be available at the company for employees to use whenever it requires. Good housekeeping is required by our company personnel. All areas will be kept in a good state of tidiness at all times, and all tools, working materials and waste shall be secured and / or discarded by our workers at the end of each working day.